Description: BNSF 153 leads Q326 towards Harrison road, as the sun starts to set. Description: A warbonnet and some passenger cars seems right at home at the station here. Description: A track geometry train eb on the BNSF Creston Sub at Oreapolis NE. Description: BNSF GP60M #153 (lead) was paired with BNSF GP60M #158. The 2 were parked on a siding right next to the Airgas Facility. Notice the rather short steep grade to the mainline ont he right side of the picture. Description: The Saturday 1st Trick local (r/t Watson to El Segundo) is seen here climing Monaco Hill on its way back towards Watson. The sun was shining brightly literally as the train hit the shadows between the trees. When it came out, the sun had gone away. Description: While the 1st Trick Local's crew has gone to beans, their trains waits in the moribund, if not totally abaondened, Lawndale Yard. Interestingly, while in Redondo Beach here, the train will pass into Lawndale shortly after it leaves Lawndale Yard. It will then proceed back into Redondo Beach before hitting Alcoa Yard in Torrance. Description: BNSF GP60M 153 and B40-8W BNSF 542 lead a local freight over a wash at Hackberry, AZ. BNSD 542 is really looking bad, the red paint GE applied to this batch of warbonnets really has not held up bad. The GP60M, purchased around the same time is looking much better. 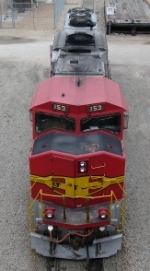 Description: BNSF 153 heads to the shop to be inspected and worked on. Description: BNSF 153 stenciled GP60M-3.